[S3128] Image of the 1901 Census for 6 Capel Street, Newport, Monmouthshire: RG13 Piece 4958 Folio 97 Page 33. BRECON AND MERTHYR TYDVIL JUNCTION RAILWAY. 13, Downing Street, 24th December 1878. In compliance with the instructions contained in the Order of the 4th inst., I have the honour to report, for the information of the Board of Trade, the result of my inquiry into the circumstances which attended the total wrecking of a mixed mineral and goods train, over which the men in charge lost all control, while descending a long incline between Torpantau and Talybont stations, on the Brecon and Merthyr Tydvil Junction Railway, on the 2nd inst. to the train behind the break-van. The three tank engines were running with their funnels in front. The engine-drivers of the two front engines and the firemen of the second and third engines were killed; the fireman of the leading engine was very seriously injured; and the rest of the servants with the train, viz., the engine-driver of the last engine, and the guard aud breaksman, who were travelling in the break-van, were cut and bruised. [S4] GRO Indexes to Deaths. "GRO Online Index: 1878/Q4 PASK, Thomas Brecknock 11b 82 age 18." [S3124] E-mail from Leslie John Warren to Stuart & Teresa Pask dated 3 January 2019. [S3129] Image of the 1861 Census for 1 Clytha Buildings, Abergavenny, Monmouthshire: RG9 Piece 3993 Folio 41 Page 3. [S2] GRO Indexes to Births. "GRO Online Index: 1860/Q4 PASKE, Tom PROBYN Abergavenny 11a 51." [S3] GRO Indexes to Marriages. "1945/Q2 PREECE, Olive M. MORGAN Bristol 6a 69." [S3] GRO Indexes to Marriages. "1945/Q2 MORGAN, Roy PREECE Bristol 6a 69." [S3133] Scanned photograph of Thomas Morgan & Family at Buckingham Palace 1957. Kindly provided by Patricia Blake née Morgan. CAPTION: The photo was taken outside the palace in 1957 when my Thomas George Morgan was awarded the M.B.E. and his son Roy Morgan was awarded the R.V.M. the same day. Cyril Morgan also received the O.B.E. on a different occasion. 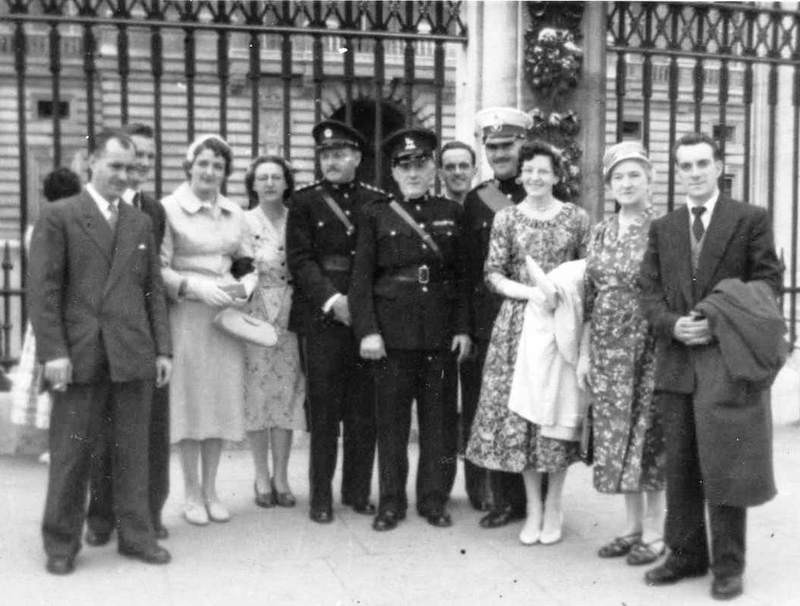 Left to right: John Wilson, John Blake, Patricia Blake née Morgan, Marian Wilson née Morgan, Cyril Morgan, Thomas George Morgan, John Morgan, Roy Morgan, Olive Morgan née Preece, Beryl Morgan née Pask, and Tom Morgan. [S2] GRO Indexes to Births. "1923/Q2 MORGAN, Cyril PASK Newport M. 11a 525." [S3] GRO Indexes to Marriages. "1946/Q3 SMART, Myra J. MORGAN Caerleon 8c 473." [S3] GRO Indexes to Marriages. "1946/Q3 MORGAN, Cyril SMART Caerleon 8c 473." [S4] GRO Indexes to Deaths. "Cyril Morgan Birth Date: 29 Mar 1923 Death Registration Month/Year: Feb 1993 Age at death (estimated): 69 Registration district: Bournemouth Inferred County: Hampshire Register number: D2D Entry Number: 213." [S4] GRO Indexes to Deaths. "Myra Jane Morgan Birth Date: 2 Jun 1925 Death Registration Month/Year: Jul 1995 Age at death (estimated): 70 Registration district: Bournemouth Inferred County: Hampshire Register number: E4D Entry Number: 151." [S2] GRO Indexes to Births. "1925/Q3 SMART, Myra J. JAMES Newport M. 11a 529." [S2] GRO Indexes to Births. "1926/Q1 MORGAN, Marian PASK Newport M. 11a 460." [S3] GRO Indexes to Marriages. "GRO Consular Marriages 1946-50: WILSON, John A. H. MORGAN Suez 44 141." [S3] GRO Indexes to Marriages. "GRO Consular Marriages 1946-50: MORGAN, Marian WILSON Suez 44 141." [S781] E-mail from Pat Maybrey to Stuart & Teresa Pask dated 17 August 2006. [S4] GRO Indexes to Deaths. "Frances Emily Paske Birth Date: 1900 Death Registration Month/Year: Apr 1984 Age at death (estimated): 84 Registration district: Evesham Inferred County: Gloucestershire, Worcestershire Volume: 29 Page: 234." [S781] E-mail from Pat Maybrey to Stuart & Teresa Pask dated 17 August 2006: Marriage 11 Sep 11, 1922 in All Souls, Evesham: Zechariah Llewellyn PASK, 30, Salesman (I think the word "Book" preceded this but the pencil is very faint), son of Jacob Price, miner, to Frances Emily Davis, 31 teacher of Sedgeberrow, d/o Frank Davis, farmer. [S3] GRO Indexes to Marriages. "1932/Q3 PASKE, Zechariah L. DAVIS Evesham 6c 468." [S3] GRO Indexes to Marriages. "1932/Q3 DAVIS, Frances E. PASKE Evesham 6c 468." [S4] GRO Indexes to Deaths. "1979/Q2 PASKE, Zachariah about 1902 Evesham 29 223." [S4999] Website UK Government Probate Search Service: PASKE, Frances Emily of Avonside Hospital Evesham Worcs died 22 April 1984 Probate Birmingham 8 June Not exceeding £40000 8451207687R.